That explained, it's now been too many days since I finished reading these books to tell you in great detail what I thought of them. I also know myself well enough to know that I don't write something down about them, I'm likely to forget them all together. Fun series. I'm debating whether or not to hand it over to my 7 1/2 year old or hold off for a year or so more. He's kind of in a reading slump and said reading is "boring" which is a horrifying word to be paired with books. So I think I ought to give him something that is more exciting. The Incorrigible Children are definitely exciting! I'm still enjoying this series and can't wait to see where it goes. The Romanov Bride was a book I had waited years to read, quite literally. First, I read The Kitchen Boy back in 2011 (linked). That book is beyond awesome and I haven't met a person who didn't like it yet. 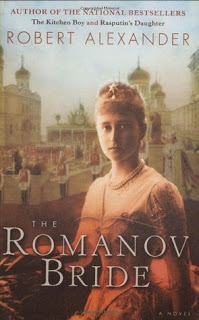 Then I read Rasputin's Daugher (also linked; also in 2011) which is the second book in this rather unofficial trilogy by Robert Alexander featuring the last tsar of Russia and his family. Now, Rasputin was a creepy, creepy guy. After reading that book I suppose I somewhat feared reading the third title because I didn't want to be disappointed. And I wasn't. Hallelujah. In The Romanov Bride we learn more about Grand Duchess Elisavyeta who is the sister to Alexandra, the last tsarina. Elisavyeta's story starts out as something as a grand fairy tale but what we ultimately learn is her life was not so happy as others might think. We see her character grow and transform as the book moves along. Pretty much every page helds some fascination for me. I loved it from beginning to end and enjoyed learning more about the Grand Duchess and the effect that the Russian Revolution had on her. I highly recommend this title (and the others in the series) to you. Additional note: You can skip the second title if you feel like you want to. You won't miss very much if you choose to do that. There are a few references to Rasputin in The Romanov Bride but nothing so complex as to leave you scratching your head. The other day I wanted to read something short, quick and happy (to feel as if I accomplished some reading) and so I picked out Goody Hall , by Natalie Babbitt. I purchased this book at our library's book sale just a month or so ago because I like Babbitt as an author. (Most especially I like her The Search for the Delicious which I cannot say enough good things about.) Fun stuff. Goody Hall tells the story of a mother and son who live in a grand house on the outskirts of town. They have no friends and keep to themselves. The only thing the townspeople really know is that the husband/father died about five years back and that his relatives have kept to themselves since his death. One day a man by the name of Hercules Feltwright wonders into town and he is hired to be the young lad's tutor. A mystery is discovered pretty much immediately upon Feltwright entering the house. Is the father dead, or isn't he? It would be a sort of fun book but the use of a medium is included to discover whether or not daddy is really dead. I've already talked about how I feel about the use of mediums so no need to repeat. Then, also, the story wraps up rather abruptly which I found to be a little unsatisfying. It felt like there was a great deal of build up only to have everything summarized too neatly, too fast. I accomplished my purpose on this one: I read a book in an afternoon. But I'll probably never re-read this particular title ever again. There. We're documented at any rate, even if my thoughts fail to go very deep on any of these particular reads. It's something! Right? 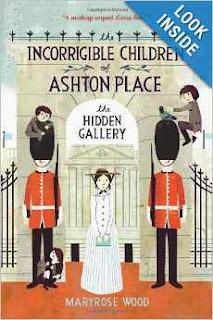 Unfortunately one of the Ashton Place books has a medium - I can't remember which one. :-/ That's been the only major flaw I have found with them so far. Our son is 7.5 also. He recently enjoyed reading the Roland Wright series by Tony Davis. Fun, clean, easy reads about a boy becoming a knight. I knew you'd love the Romanov Bride! And I totally could have written the opening disclaimer to this post myself. I have missed quite a few reviews this year due to the fact of procrastinating them and then the mood (and remembrance) was gone as I involved myself in other titles. I laughed out loud at the "better to feel guilty than bitter".